Do you have hidden talents that you may not be aware of? Well, don’t keep them hidden away too long. Latrobe Music is a community organisation bringing exciting music workshops to the Gippsland region. Our workshops and events are led by experienced artists and are open to all ages and abilities. This gives you a chance to learn music-making skills in ukulele playing and singing in a fun, entertaining atmosphere. Latrobe Music also gives you the opportunity to perform live in front of an audience. Spread the word! Tell people all about Latrobe Music and our great workshops and private ukulele lessons. Please promote our organisation in your newsletters or on your website or social media pages. If you are in the Latrobe region and require ukulele tuition – look no further! All lessons are for complete beginners and open to all abilities. You must provide your own ukulele and tuner. All lessons will go for 1 hour throughout the day during the week from 10am to 6pm and run from Phillip's home. COST: $20 per person for one hour. 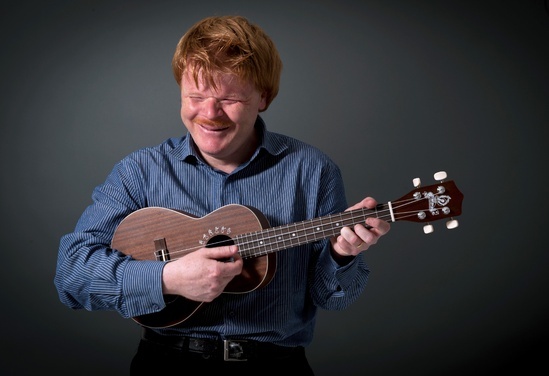 Phillip Chalker is a singer, songwriter, performer and ukulele teacher, workshop facilitator and a community music worker based in Traralgon within the Gippsland Region. Over the years he has traveled extensively performing for a wide variety of audiences with his faithful companion and Seeing Eye dog, Roddy. The instruments Phillip plays are ukulele and acoustic guitar. When performing he has a great sense of humour with audience participation. Phill’s repertoire includes favourites such as Bad Moon Rising, Achy Breaky Heart, Midnight Special and other classic songs. Phill has recently completed he Certificate III in Music from Kangan Institute. 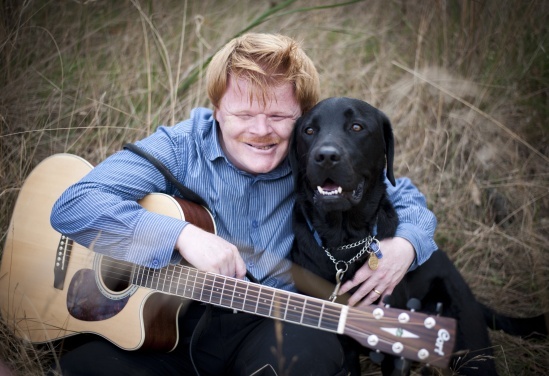 He has also been involved with Victorian disability arts organisations Wild @ The Arts and Club Wild as a live performer, convenor and a committee member for the Gippsland region. He has also volunteered his time with community Music Victoria. Phillip is also a manager and Wordpress editor of his own website Latrobe Music which was established in August 2014. He specialises in parties, community events, functions, festivals, day programs, schools, performances in shopping centre, pubs, clubs, conferences or aged care facilities. Phillip Chalker is also a disability advocate for people who are blind or Vision Impaired. Phillip Chalker is also a Member of candomusos, an organisation supporting Musicians with Challenges all over the World. When Phillip is not doing music related activities or workshops he also is managing his other small business name Gippsland All Abilities social Group, www.gippslandallabilitiessocialgroupblog.wordpress.com, which brings people of All Abilities together. u really do cater to all abilities. As a more advanced learner I have felt that I have gained a clearer understanding of the ukulele giving me much more confidence in playing whilst keeping it light hearted and fun. Phillip Chalker's Latrobe Music is a community organisation bringing exciting music workshops to the Gippsland region.